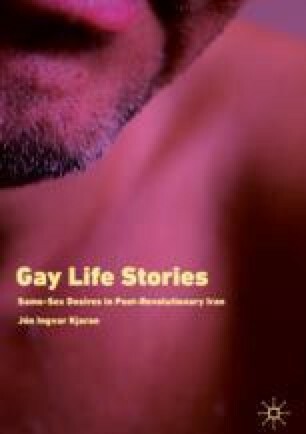 The chapter provides an overview of the book and its particular focus and contribution to the generating of knowledge on sexual minorities in the Middle Eastern context. It describes the aims, structure, and research questions that informed the study. The methods used, the setting of the research, as well as the researcher’s positionality are discussed. The focus is on describing the ethnographic approach used when collecting the data and introducing the research context, Iran/Tehran, as well as those who participated in the research. Ethical questions relating to conducting research underground are addressed. Alimardani, M. (2018, January 1). What Telegram Owes Iranians. Never in History Has a Protest Movement Depended so Much on One Technological Platform. Will the Company Uses Its Power Wisely? Politico Magazine. Retrieved from https://www.politico.com/magazine/story/2018/01/01/irans-telegram-revolution-216206. Dehghan, S. K. (2017, December 31). Iran Correspondent. Rouhani Acknowledges Iranian Discontent as Protests Continue. The Guardian. Retrieved from https://www.theguardian.com/world/2017/dec/31/protesters-who-spread-fear-and-violence-will-be-confronted-says-iran. Homosexuality iii. In Persian Literature. (2012, March 23). In Encyclopædia Iranica. Retrieved from http://www.iranicaonline.org/articles/homosexuality-iii. Najarian-Najafi, Z. G. (2017, July 13). The Ayatollah in the Moon: On Class Power and Dynamics in Islamist Iran. Retrieved from https://medium.com/@zacharygeorgenajariannajafi/the-ayatollah-in-the-moon-on-class-power-and-dynamics-in-islamist-iran-c248fc5cbe06. President Misquoted Over Gays in Iran: Aide. (2007, October 10). Reuters. Retrieved from https://www.reuters.com/article/us-iran-gays/president-misquoted-over-gays-in-iran-aide-idUSBLA05294620071010. Whitaker, B. (2007, September 25). No Homosexuality Here. The Guardian. Retrieved from https://www.theguardian.com/commentisfree/2007/sep/25/nohomosexualityhere.